The postal history of Imperial Russia's Railway Travelling Post Offices is well understood and there are very informative reference books and articles, notably those authored by Anatoly Kiryushkin and Philip Robinson and now also by Valentin Levandovsky. Other collectors are undertaking very detailed researches to expand on the knowledge base we already have. The first world war and then the civil war in Russia was a catastrophe for the country's railways. Rail lines were physically destroyed, rolling stock was also destroyed or became unusable, there were repeated fuel shortages. The army, civil war armies and even bandits took over trains. As a result, the range of TPO services available greatly declined from 1914 onwards. I don't think it ever recovered. So it is quite unusual to find in a dealer's box an item like that shown above. Here we have a new post-Imperial cancel for POSHT 68 VAG 30 4 24 - Postal Wagon 68 - operating a short time after the creation of the Soviet Union. The letter, franked at 20 kop is addressed to Mr J [ or possibly I] Brodsky, 48 Reynolds Ave, Provedence [sic] R.I [Rhode Island], America. But there are no transits or arrival markings. 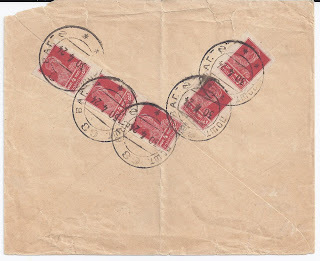 At some point, the well-worn envelope has been folded in half centrally perhaps to be sent within another envelope. I have no idea of the route on which Postal Wagon 68 operated or for how long. So it is over to my readers ... who have very rapidly obliged - see the Comments posted below by Howard Weinert and Ivo Steijn. Thanks to both of them! Probably Kherson-Kiev as it was before the revolution. 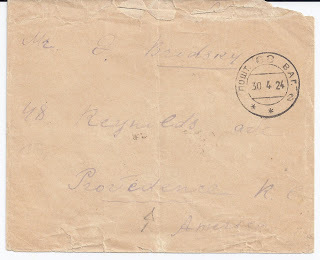 Certainly in the Ukraine because the word for "postal" is spelled with a sh, not a ch.